What’s keeping you up at night? Chances are it is worry. Let’s face it, in our hectic lives there’s always something to worry about, even if it’s the state of the world. Worry can contribute to insomnia, or trouble falling asleep. Worry can also cause what is called “maintenance insomnia” or difficulty in staying asleep. This is when we wake us up in the middle of the night, and then have a problem getting back to sleep. Why does worry affect our sleep so much? During the day we might have all the same worries – but we’re engaged in other activities that take the mind elsewhere. At night, when it is quiet and the mind isn’t distracted, all those same worries come to the forefront of the mind, and we can’t seem to quiet them. It is important to give ourselves that “wind down” time to help settle the mind before hitting the sheets. Read, meditate, listen to soft music, or take a warm bath. And of course, make sure your mattress is supportive and comfortable as this is the key to having a cozy bed to climb into. Worrying is nothing new. It happens to everyone, all over the world. 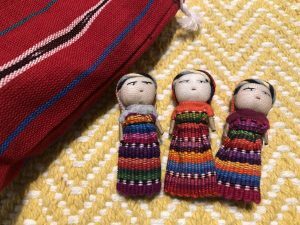 Generations ago, the indigenous people of Guatemala created “Worry Dolls” as a remedy for their stress. These are tiny dolls, hand-crafted with fabrics from Mayan costumes twisted and tied around little pieces of wood and wire. It is all held in place with colorful yarn, which makes up the doll’s head, hair, feet and hands. At just two inches high, the dollars are small enough to tuck under a pillow. The tradition is that when worrying keeps you awake, you tell your worries to the doll, who then does the worrying for you so that you can sleep peacefully through the night. This is the traditional story of how the worry dolls came about, and it is a wonderful way to introduce worry dolls to children to help them get to sleep. In the hills of Guatemala there lived an old man, his daughter, Flora, and Flora’s two children Maria and Diego. Their home was a small hut made out of mud and wood. The grandfather was a farmer, as many of his ancestors were, and as he taught his own family to be. One year there was a terrible drought. Without enough rain the crops could not grow well, and they had very little food. The whole family would wake up with the sun and tend to the fields in the hope that the rain would come. Then Maria and Diego would go to school for the day. At night, Flora would make tortillas for dinner with what corn they had, and then weave colorful cloth to sell at the market. Grandfather would tell the children stories before tucking them into their hammocks at bedtime. One of the children’s favorite stores was about a magical doll that could grant wishes. One night a robber snuck in and stole all of Flora’s cloth, everything she had worked so hard to make over many months. She cried that she had nothing to sell at the market and didn’t know how the family would get the money they needed. The next day Flora came down with a fever, and Maria knew that she had to do something to help. She got an idea. She went through her mother’s weaving basket and found scraps of fabric in odd colors and shapes. She brought the basket outside, and told her brother to collect small twigs for her. With the scraps of cloth and the twigs Diego and Maria got to work. They worked late into the night, and kept their project a secret. When they ran out of cloth they saw that they had made dozens of tiny dolls in tiny clothes. Maria hoped that these dolls would be magical like the one in her Grandfather’s story. That night Maria lined up a few of the dolls and spoke to them of her worries: “My little friends, we need your help. My family is in trouble. The fields are dry, my mother is sick, and we have no food or money. Please help us. Good night.” She placed the dolls lovingly under her pillow and lay down to sleep. Maria slept well that night, confident that the dolls would somehow help her. In the morning, Maria and Diego packed up all the dolls and walked a very long way to the market. The family was so poor that the children didn’t even have sandals, they had to walk barefoot. When they finally got to the market they found that it was crowded with people. They had never sold at the market before, and she had never seen anyone else sell tiny dolls there, but she was determined that her plan would work. The two finally found a good spot near a shoe seller. “Magic dolls!” Maria corrected her brother. Maria and Diego excitedly wrapped up the dolls for the man, who then handed them a stack of money, without asking the price. Maria thanked him and the man was gone before Maria could say anything more. She counted the money and found that there was enough for the family to live on for a year. The two bought some food at the market and then excitedly headed for home to tell their mother and grandfather the news. “We sold the dolls we made!” Diego exclaimed. “Magic dolls!” Maria emphasized, and she told them the whole story. “And look! It’s raining!” Diego jumped up and pointed to the fields. Sure enough, it was raining and the fields were getting the water they needed. The drought was over. "Ask thyself, daily, to how many ill-minded persons thou hast shown a kind disposition." Therein lies the challenge! Sure, we can be kind to children and animals. We can be kind when someone is kind to us. But to maintain our centeredness and be kind in spite of conflict, animosity, anger - ah, there's our real opportunity for spiritual growth!